DHARAMSHALA, Sep. 28: Tibetan legislators voted overwhelmingly to vote for amendments in the election rules that bars non-governmental organizations and Cholka (regional) associations from endorsing Sikyong (President) and candidates for the Tibetan parliament in the future. The reform amendments introduced by MP Serta Tsultrim secured overwhelming majority constituting over two-thirds of the house on Thursday. Legislators said that politics of regionalism and interest-based endorsement seen in the last general elections in 2016 contributed significantly to disharmony and upheaval in the Tibetan community during the campaigning and election. Opposing arguments presented by some MPs contradicted the amendment saying that doing away with the practice may be against democratic rights of Tibetans and too far a measure in curbing disturbances seen during elections and campaign season. Other new reforms in the electoral rules of the exile Tibetan government known officially as the Central Tibetan Administration also mandates declaration of at least two presidential or Sikyong candidates in the final election by the Election Commission. In the event of a lone Sikyong candidate, he/she must secure a minimum of 51% of the votes in the primary election to be declared the winning candidate, failing to which the primary ballot will be recast. The reform also states that a Sikyong candidate will be declared winner if the candidate secures more than 60% of the votes in the primary election and hence no final election will be held. 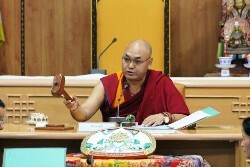 The 16th Tibetan parliament in Exile’s sixth session concluded on Friday.